Our neighborhood garage sale is my favorite weekends of the year. I’m an avid garage sale shopper, but being on the selling side is a totally different experience. Of course, the main reason I like having a garage sale is to make money using garage sale hacks. But in addition to this, you can actually have a lot of fun hosting a sale! When you have a garage sale, you get to work on your marketing and negotiation skills, socialize with shoppers and get rid of junk. I try to live as live as frugally as possible, but it’s easy for clutter to creep in. I anticipate this bi-annual clean out of our home. Whatever does not sell at the garage sale is dropped off at a thrift store directly after the sale ends. No junk returns to our home. But what does return – is cash in our pocketbook – and I’m going to tell you exactly how I do it. Today I’m offering my best garage sale hacks which will help you to have a wildly successful yard sale as well. Every time we have our sale, shoppers comment on how nice our sale items are and how organized the sale is. Have a lot of items to sell. When shoppers walk up to a sale and see two tables and not very many items they tend to walk away quickly. To draw in shoppers in, have a lot of items for sale – and large items. The large items should be placed in the driveway, or on the outskirts of the garage. This way, shoppers see the large items and are enticed to walk up. They automatically assume you have more good items for sale! Clean the items prior to sale. Nobody wants to buy dirty, dusty or broken items. Make sure everything you are selling is worthy of sale and cleaned prior to the sale. I often pack items away for the sale in the months leading up to our garage sale, this way they stay cleaner and are protected in a safe place. Then I clean and dust the items as I arrange them prior to sale. Sometimes, all an item needs is to be wiped down with a Swiffer dusting cloth to make it look new again. The same applies for kitchen items and used clothing (which should be freshly laundered). The price is right. 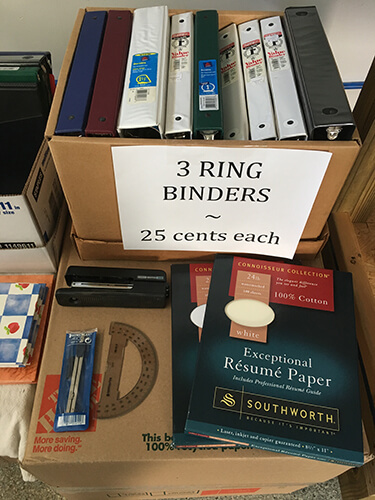 My philosophy as a garage sale shopper is that I buy items that are either unique and hard to find – or items that are priced so low that they are cheaper at a yard sale than buying at a dollar store, thrift store or secondhand. 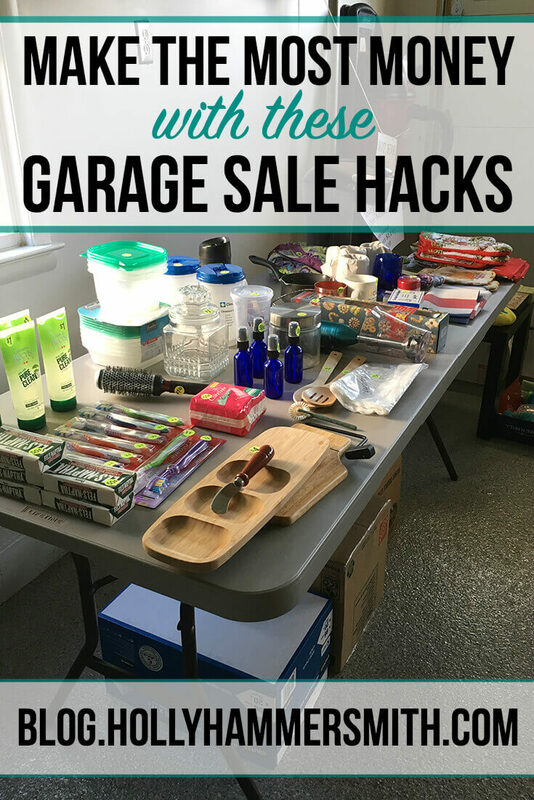 Most of the items at our sale are a bargain to begin with – which is one of my garage sale hacks. This means many items are priced as low as 25-cents or 50-cents. These small sales do add up. Then, at lunchtime, when the sale is half over, I typically mark everything half off. I also am happy to negotiate with shoppers – although I’m not incredibly apt to negotiate the moment the doors of my sale open. Organize by category. If you are selling kitchen wares, keep those items together all on one table. I think this helps shoppers who are looking for a specific type of item. If they want a measuring cup, and find it, they may also purchase a similar item next to it – such as measuring spoons. This comes down to basic presentation at your sale. Hang, package and arrange items neatly. In addition to organizing by category, make sure your items are easy to view and purchase. Clothing is best arranged on hangers, if possible. 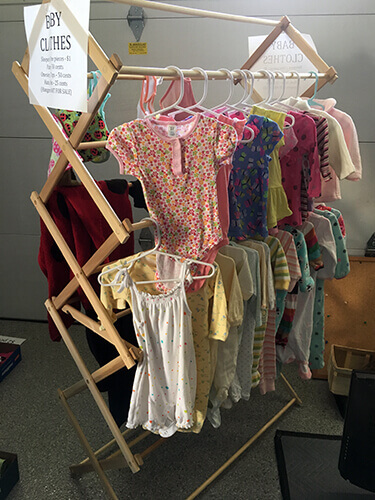 This year I used a wooden laundry rack to display baby clothes. Small items can be placed in clear sandwich bags or gallon freezer bags and then labeled with a Sharpie marker. Items such as extension cords can be secured with a rubber band. These small steps not only make it easy for a buyer to purchase an item – they also eliminate messes and accidents. It also helps to keep smaller items from being misplaced or lost. Clearly label and price all items. As a shopper my biggest garage sale pet peeve is the sale where the seller says “Everything is negotiable,” and then I look down to see absolutely no prices on anything. Where do you even begin to negotiate? It’s too much work and I usually do not buy anything at that sale. If you are going through the effort to spend a Saturday manning a yard sale table – take the effort to price all items. I use garage sale stickers and I also create my own 8.5 x 11 printed signs on standard office paper for large or big ticket items. On the printed signs I often describe the item in detail, mention the working condition and the original retail price. This lets people know what an amazing deal they are getting! Making payment easy. I only accept cash. Some sellers today are accepting payment via credit card at garage sale, but I am not comfortable venturing into that territory yet. I personally have never used anything but cash at yard sales and have yet to have anyone ask me if I accept credit. I have been asked if I will take a check and I will not due to the risk of a check bouncing. It is also wise to be cautious about accepting large bills – and checking to see if they are counterfeit. I do not like wasting time counting small change so I also do not price any items less than 25-cents. Have a FREE box. Inevitably, any time I have a sale I have some items not worthy of a 25-cent price tag, yet also should not be thrown away. These items go into the free box, which I usually make out a office paper ream box. 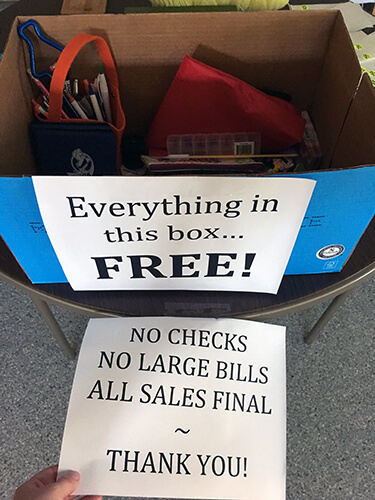 The free box is placed near the check out table – where buyers make their purchase. Often, shoppers are so excited to receive a freebie that they will make a purchase or linger at the sale long enough to find an item to purchase. Plus, free items just make everyone smile. I especially like to include small toys and trinkets for children in the free box as one of my garage sale hacks. Offer bags to customers. This may seem like a simple task but I think it adds to the professionalism of a sale. Save and offer plastic or paper grocery bags to your buyers when they make a purchase. I don’t have any proof that offering bags leads to more sales but it is a nice courtesy to provide your buyer. This is one of my simple garage sale hacks that doesn’t cost you any money to provide. Move items as others sell. During your yard sale, in addition to marking down items when the time is right, be sure to move and condense items as sales are made. If items are on the floor at the beginning of the sale and room opens up on the table – move those items to the table. This not only showcases all of your remaining items in a more clear fashion, this also saves time at the end of your sale with clean up. Make accepting payment easy. Similar to how I price items accordingly, with no item under 25-cents, I like to make accepting payment easy. First, I make sure to get change from the bank prior to my sale. This is typically $100 in cash, ranging for quarters up to $10 bills. I organize the cash in a money box for easy access. Some sellers use an apron with pockets to hold their money. Also, the first rule of thumb with your money – do not leave your money! Make sure someone is watching the money at all times. It’s helpful if two people are available to run and man the garage sale. If your money begins to add up (yay!) empty out the money box mid-sale and reset your cash back to $100. Market your sale. 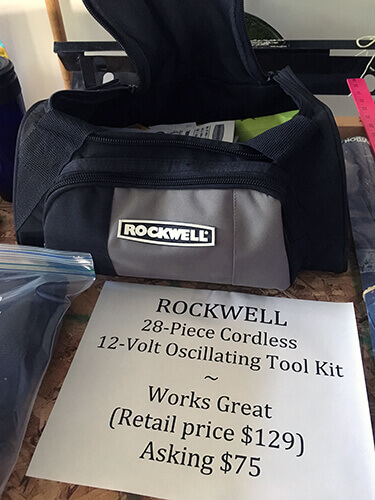 Marketing a garage sale can take many forms but the simple ones I have used and follow include: buying an ad in the newspaper classifieds section; placing an ad on Craigslist – with a detailed description and photos; and posting ads in local Facebook groups. You can also blow up and place colored latex balloons, or other markers, such as a garage sale sign, by your street or driveway or yard on the day of the sale to attract customers who may simply be passing by. 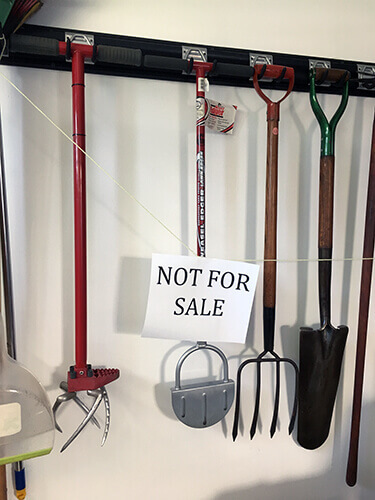 In addition to the large items you have placed outside of the garage – as another one of my garage sale hacks – you want some flashy colors on or near your sign to let people know that you are having a sale and to come on over! As far as the classified ads and Craigslist ads – put those out several days before the sale. Some people will see your signage and stop by the day of but others like to plan ahead. If the sale is on Saturday – advertise on Wednesday or Thursday – at the latest. There you have it. Those are my personally tested, tried and true garage sale hacks for having a wildly successful yard sale. It does take a little planning and preparation to have a profitable garage sale, but I promise the effort will be worth it. As I mentioned at the beginning, consider donating any items that do not sell to charity. Or you can take gently used clothing to a women’s resale store such as Clothes Mentor to receive cash for clothing (use my Clothes Mentor link to receive a coupon for $10 off your first purchase!). Lastly, be sure to have fun during your sale! Smile, say hello, and chat with your customers. You never know which one is about to make that big purchase you had been hoping for. Holly, when I clicked on Clothes Mentor and filled in my information, I was informed that I was not eligible for the $10 off coupon. Hi Paula: I’m sorry to hear that. I’m not sure what would prompt that response. Maybe the email address has already been used on their email list before? You could try calling their customer service line at 1-877-766-6574 to ask. Thank you for the great advice. After Christmas my family has so many unwanted and unused item you really helped me put something in order!! I’m glad this was helpful! Yes I’m in the same boat wanting to get rid of some items now that it’s the New Year.